Camshelving® Shelf Rails In Action! 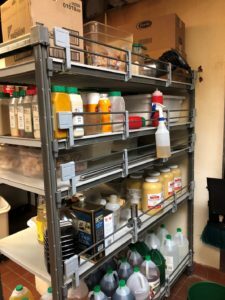 Anyone who has ever been in a commercial kitchen has likely seen some sort of shelving – whether it be in the dry storage area, prep area or a walk-in cooler. Shelving is typically designed for storage but can also be used as a drying rack! In most cases, you will see shelving backed up against a wall to prevent spills and breakage (seen that…cleaned that)! Cue Cambro Camshelving® Shelf Rails. They’ve created the perfect solution for securing your shelf contents. These shelf rails are designed for Premium and Elements Series shelving and also works with drying racks and shelf dividers. 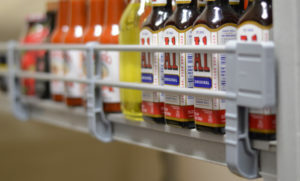 If you are in the market or interested in improving your operation’s workflow with Camshelving shelf rails, please reach out to our brand champion, Michael Riley or give us a call at 770.667.1544. Take a look at this video to see how easily they can be installed!